Xiaomi Yeelight Lamp is smart and easy to use. You can even control it with your phone. It will certainly bring you brand new experiences with lights. Download Android Application latest version 2.3.22 from here or here. 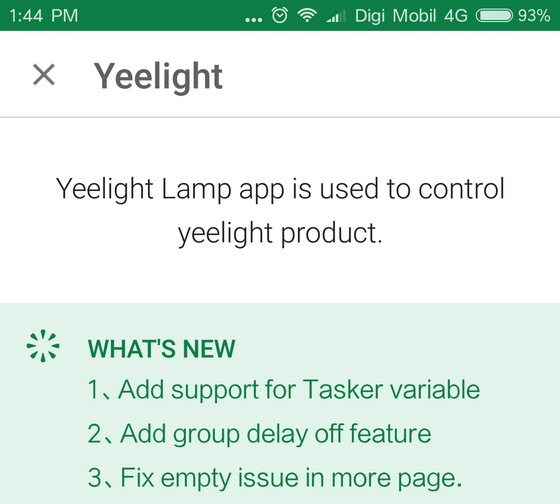 (Yeelight_com.yeelight.cherry v2.3.22.apk – 13.1 MB). Download previous version 2.3.19 from here. Night mode. When you wake up at midnight, swiping the touch wheel on the top will turn on the lamp with gentle lights which make your eyes conformtable and avoid disturbing your family. Sleep timer. You like falling asleep with light on? Bingo! Yeelight lamp could turn off automatically after the time you set. Phone control. You could connect your phone to apllication with Bluetooth 4.0 to set brightness, color, color tempreture as well as color flow with 16M colors. It will bring you totally different experiences! YL 3rd-party control protocol is a feature designed for developers and fans of IoT. All YL WiFi products that are currently on market ( LED bulb (White), LED bulb (Color)) as well as upcoming WiFi light products will support this protocol. Based on this protocol, users can develop their own applications and programs to discover and control Yeelight WiFi devices by using their favorite platform or language. This control protocol uses a SSDP-like discovering mechanism and JSON encoded controlling command, developers can discover and control their devices dynamically under the same LAN. Attention must be payed to following security issue: all the discover and control messages defined in this protocol are not encrypted, which means Yeelight devices’ security is guaranteed by the router’s security level, therefore user must be responsible for their devices’s security when using this control protocol. 3. Fix empty issue in more page. What do you think about this new version?